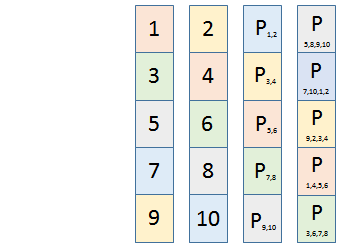 In addition to typical RAID layouts like RAID5 and RAID0, there are more complicated schemes, which are nevertheless based on the same RAID technology. 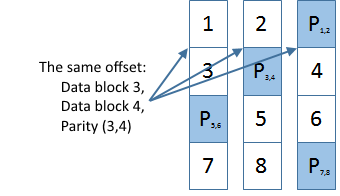 The main difference is that standard RAID layouts imply that data and checksum blocks are located at the same offsets on all the RAID member disks. However, in the definition of RAID there is no restriction on that data and checksum blocks must be "horizontal", the only requirement is that all blocks involved in the calculation of the checksum must be on different disks, and the checksum itself must be on yet other disk. 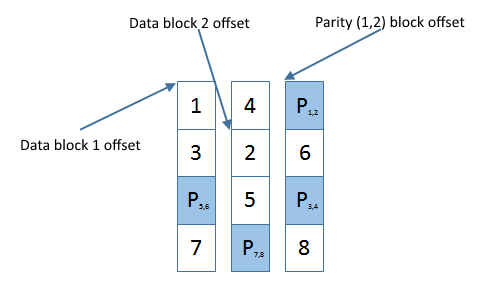 This leads to all sorts of variations, like calculation of parity over diagonal (so called RAID-DP), rather than horizontal rows. In the software RAID world, complex RAID schemes are used in Drobo devices and hardware rigs built with Microsoft Storage Spaces. Due to the complexity of such layouts, ReclaiMe Free RAID Recovery doesn't work with them. In their devices, e.g. Drobo 5D, Drobo 5N, and Drobo FS, Drobo uses the Drobo BeyondRAID technology, which provides single or dual disk redundancy. Redundancy in Drobo devices is ensured by the mirroring and parity techniques. However, unlike standard RAID1 and RAID5, mirror pairs, data and parity blocks in Drobo are not located at the same offsets. More than that, in Drobo, block size can vary. Let's explain – in a typical RAID5, block size is the same throughout the array while in a Drobo device it could easily be that block 2 and block 3 are of different sizes. Drobo recovery radically differs from a typical RAID recovery procedure. Surely, Drobo metadata contains all the characteristics of a particular Drobo layout; however, even reading Drobo metadata is not a trivial task. In case of damaged metadata, Drobo recovery is even more complicated. For more information about Drobo recovery please visit this site. Storage systems working under MS Storage Spaces use the very same RAID technology as regular RAIDs use. However, the difference is that disk space on the pool member disks is cut into the 256 MB slabs which are then combined into mini RAIDs. The approaches used to Storage Spaces recovery, as well as to Drobo, radically differ from those used in regular RAID recovery. More about Storage Spaces recovery read on this site.